Chandragutti was a last minute addition to my itinerary for the day. I started with a stop at Hangal to locate Kichakana Garadimani and gave up the search after hearing that it did not exist anymore. Next was Kotipura. 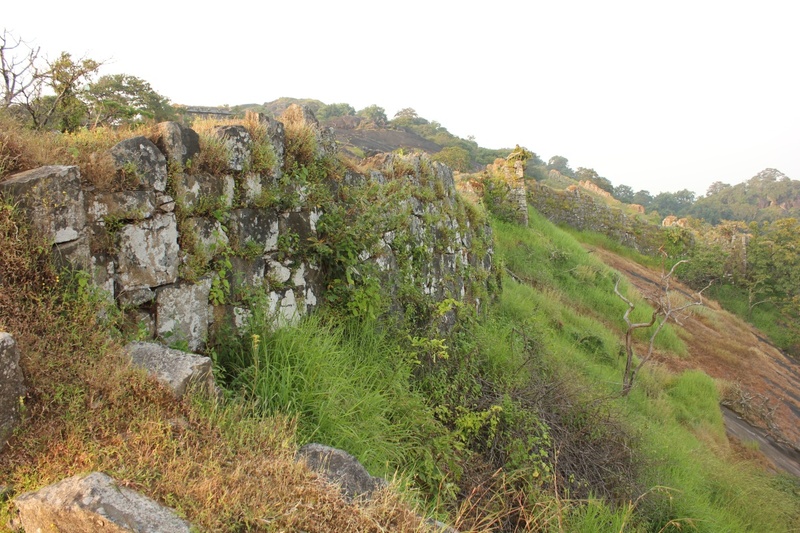 Then a look at the sad remains of Anavatti fort. Next was a short stop at Togarsi Mallayya temple. At Belligavi, our stop at was longer than planned. 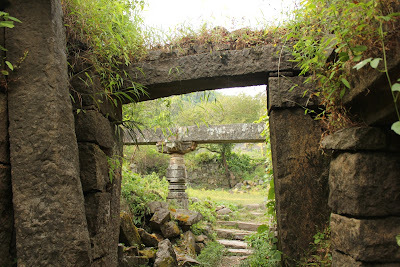 A guide at Kedaresvara temple told me to visit the lesser known temples of Belligavi and also temples of Talagunda and Bandalike, which we did visit. Lunch at Siralkoppa. We passed through Soraba. Chandragutti hill was visible with some 5km still go. Yellappa asked me if I really wanted to climb that hill. Of course! Finally we reached Chandragutti at 4-15. Chandragutti, (Chandraguptapura of ancient times) was a stronghold of the Kadambas of Banavasi (3-6th centuries A.D.). 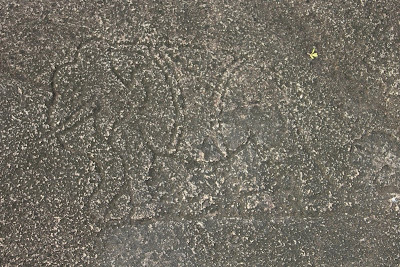 In an inscription dated 1396 A.D. of the reign of Vijayanagara King Harihara II (A.D. 1377-1404), Bachanna, a local chieftain claims to have ruled over Chandragutti later the area was under Keladi Nayakas. Renukadevi temple situated on the summit of an elevated spot and is a large natural cave approached by a flight of steps enshrining a small masked Siva-Linga. 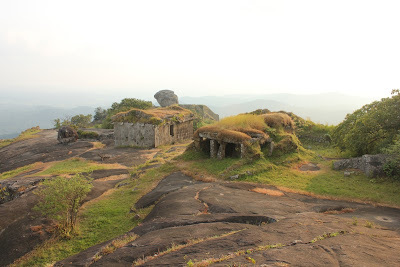 The place has been associated with saint Jamadagni and his wife Renuka. 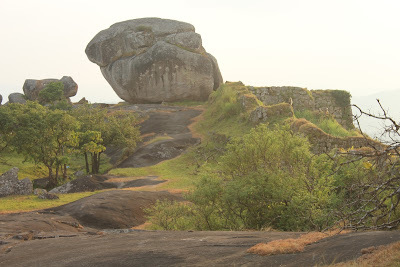 The colossal hip like boulders in the cave are identified as Renuka in hiding when Parashurama pursued her. The outer facade of the cave forms the vestibule, which is in the Chalukyan style. A pillared hall was added during the Vijayanagara period. 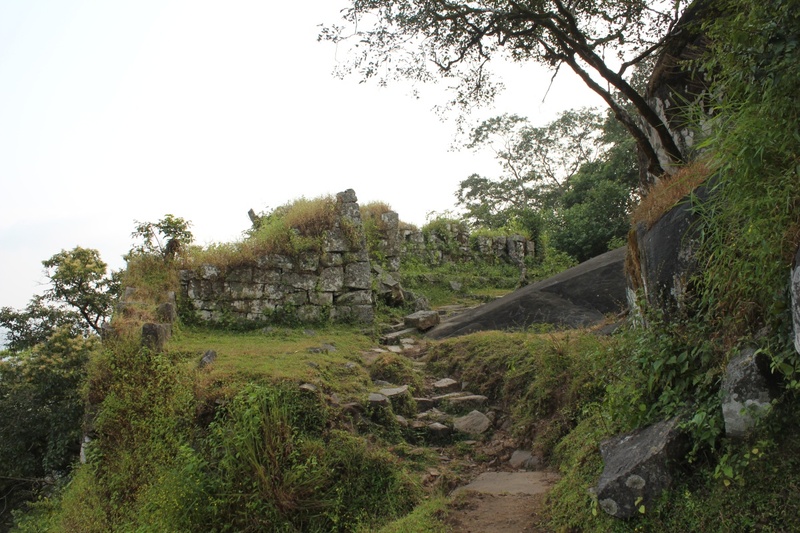 Almost at the foot of the Renukamba temple facing west is a temple of Bhairava. A five minute climb up a steep flight of steps, I was below the looming rock formations of Renuka temple. Path to the fort start just behind the temple. I overheard an elderly lady deny permission to two young women who wanted to see the fort :( two disappointed ladies. Welcome to the jungle. After a 10 minute I was at the first gateway, not much of the walls remain. 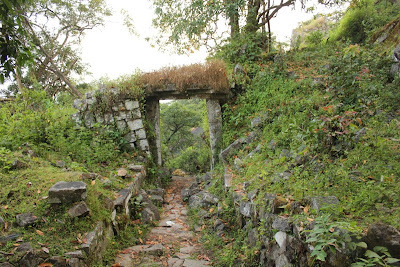 Kotkere (Fort Lake) has created an opening in the jungle. 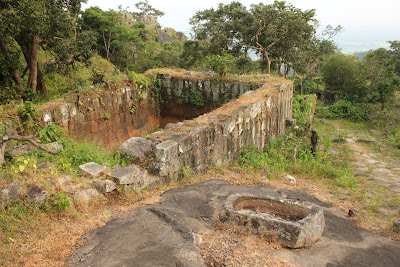 This would have been the major source of water back then. The path rose constantly and the jungle got thicker. I could hear thunder in the distance. Somehow I wasn't bothered about rain. I walked at a constant pace, breathing heavily, sweat dripping down my face. I would pause for few seconds to take pictures and a quick rest ...I was never so determined. 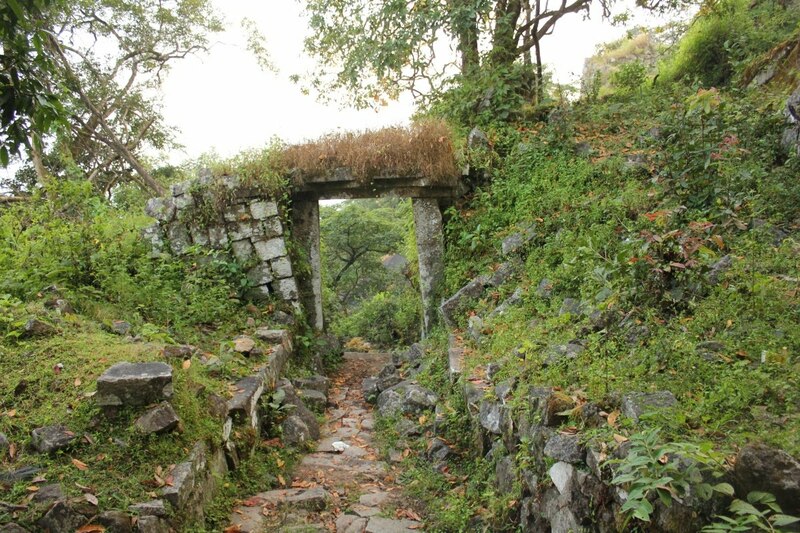 Second gateway, I felt great to see these walls standing on these hills, amidst a thick jungle, bearing the brunt of nature's forces. This structure looks well designed to block enemy advances. 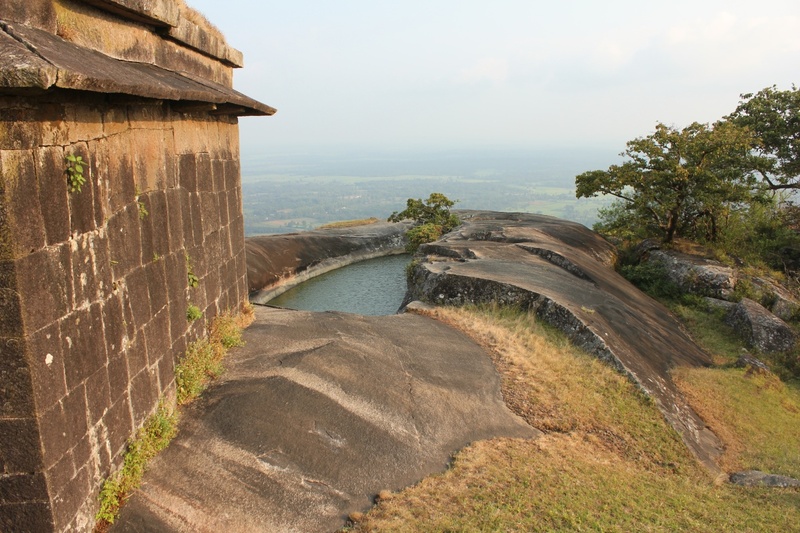 A shelter for sentries and an overshooting platform for soldiers to shoot arrows or fire guns provide clear view to the guards. The gateway is pretty complex with two passages; one wide enough to let a horse through and another just wide enough for a man. Platforms and chambers flanking the passage would have served as security offices. 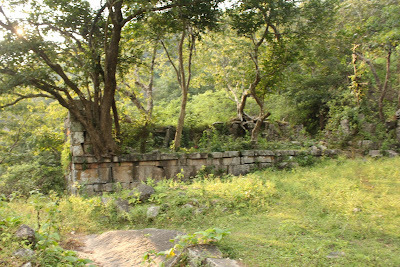 This could be ruins of small house, perhaps made for high ranking military officers. 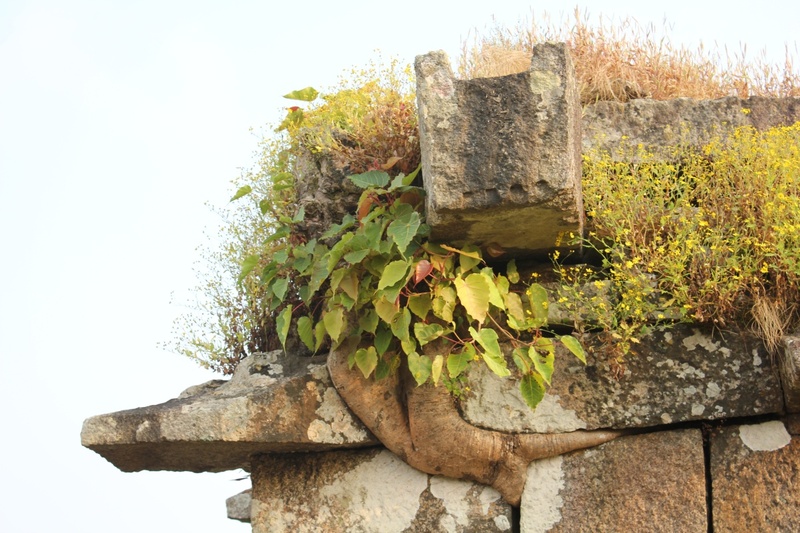 Plant life have taken over many portions of this formidable fort. Few minutes from the second gateway, I ran into a herd of cows blocking the narrow path. But I was comfortable walking through them, not one tried to get defensive :) Few steps ahead I saw the cowherd, his name was Laxman. I asked him how much more to go. He said another one hour's climb. I told him I came here in 15 minutes. In that case you'll need another half an hour. I went ahead, increasing my pace slightly. I realized my sandals were hindering my pace. I left them in the middle of the path just before this gateway. 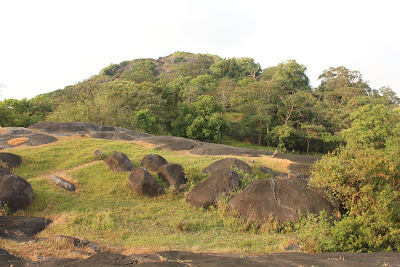 That's the summit and the innermost fort, it was exactly 5PM. I made it here in 45 minutes! I decided to hang around for 30 minutes, I need to get back to the temple before it gets dark. 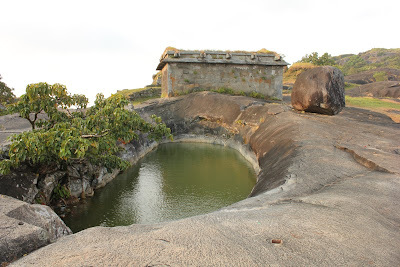 The fort has five ponds to store water or liquids. A dead cow lies in the center of this pond. This one supposed to be Yenne Bavi, meaning oil well. Perhaps back then this was used to store oil. 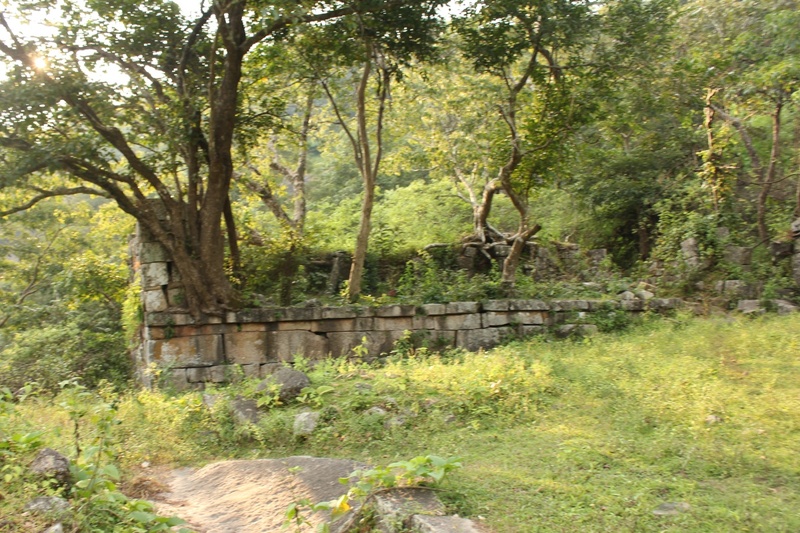 In the background is a small structure built of stone. I walked slowly enjoying the fresh cool breeze blowing in from the west. 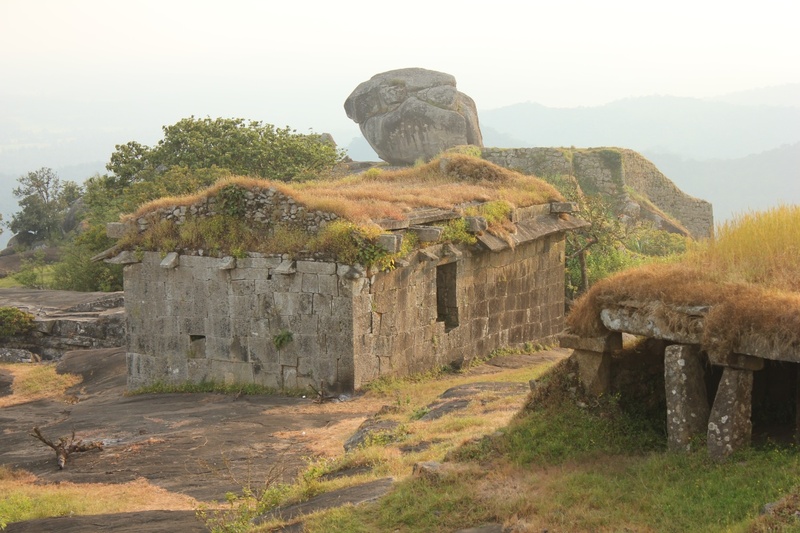 This structure is supposed to be 'Maddina Patana' meaning 'ammunition store'. So the fort did have fire power. The structure looks solid, well preserved. This ficus looks 5 to 8 years old, its my guess. 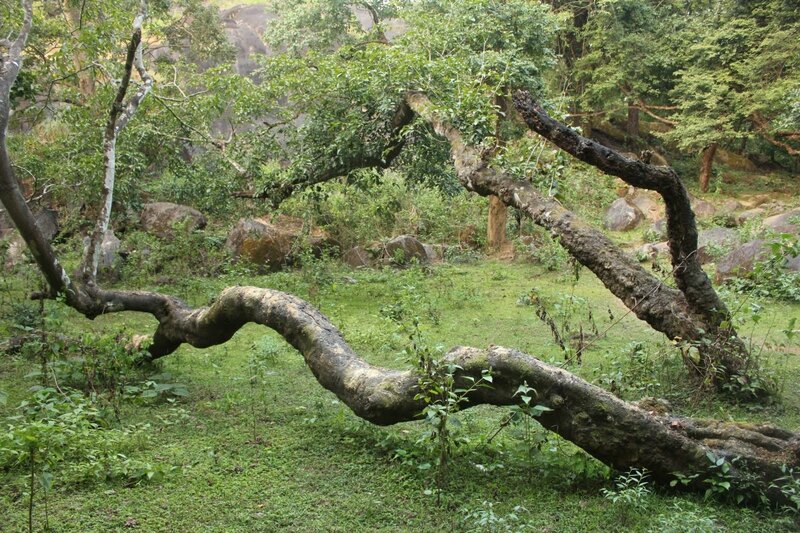 Case of natural Bonsai. Plant life proves time and again that they are the bosses. 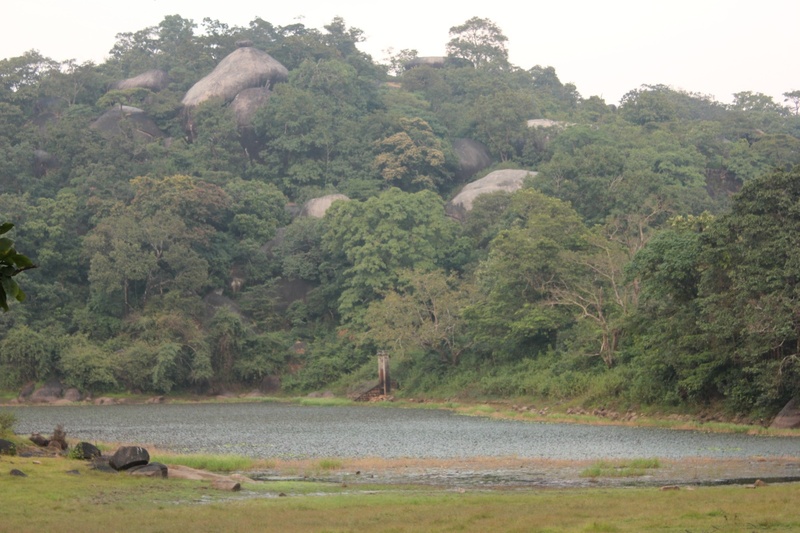 Fresh water pond behind Maddina Patana. 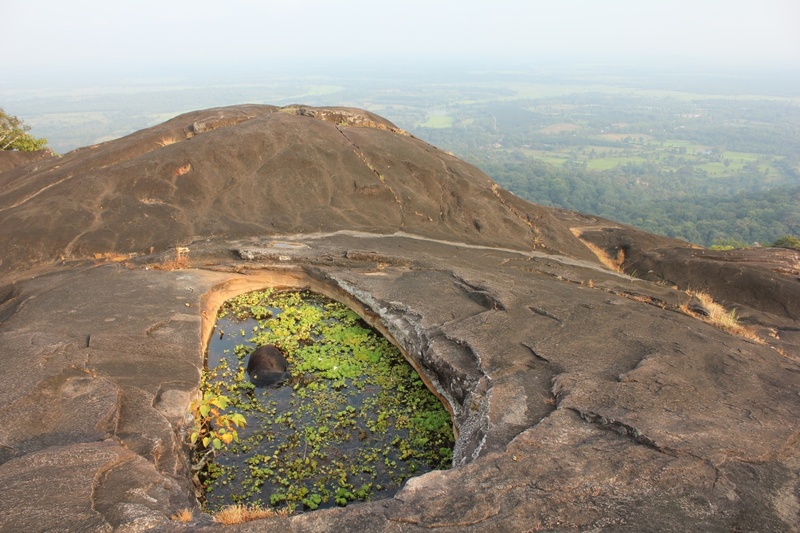 The pond is known as Kote Bavi meaning 'fort well'. Water was really clean. I curbed my temptation to dip my feet and wash my face ...side walls are too steep. One wrong step or a slip, I could land in the pond. 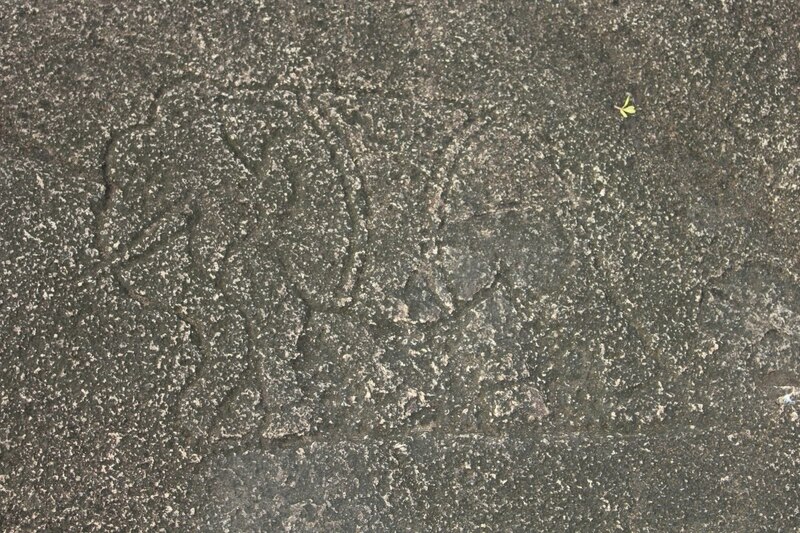 An elephant inscribed close to Kote Bavi. 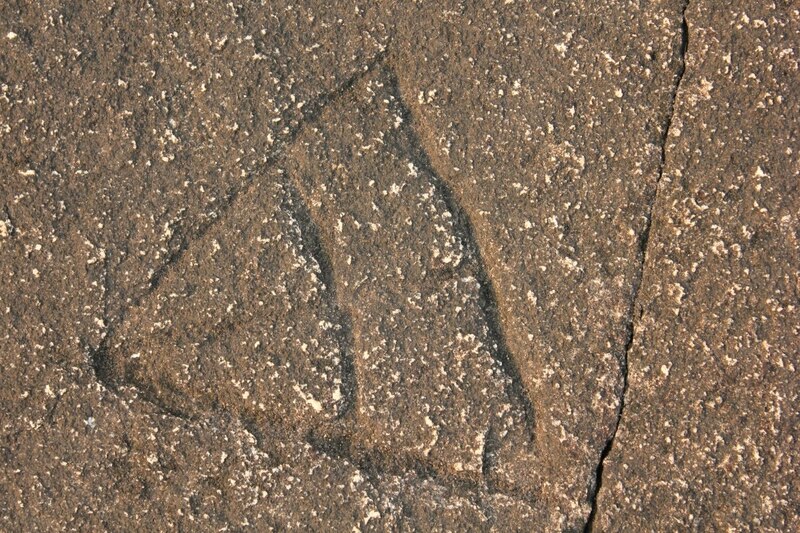 A triangle with a cross. 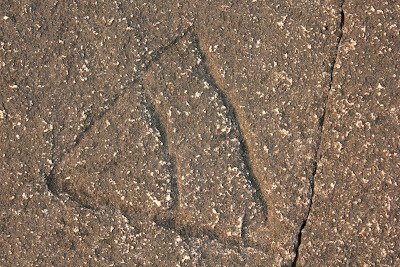 Any guesses what this depicts? Looking south from Kote Kere. Remains of the wall. 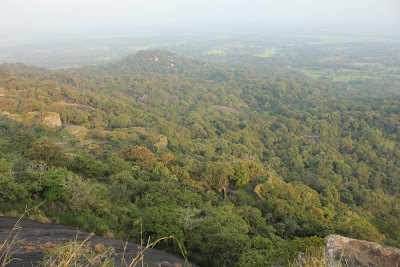 Jungle and paddy fields below. I wonder how this looked during the days of Shivappa Nayaka. To the north is Durgi Dibba, the highest point of this fort. 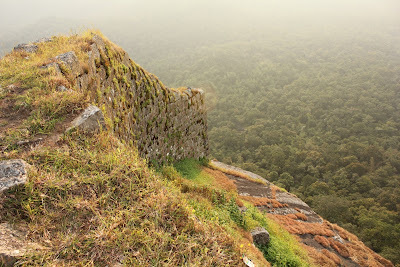 I could not go up there :( since I had to explore the western side, where walls are built on steep rock faces. 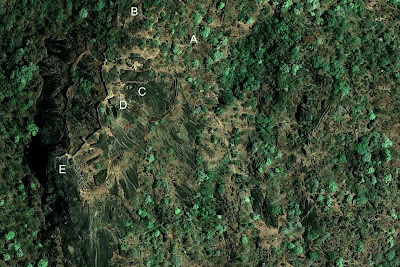 Beyond the hulking boulder with an X on it is a steep slope vanishing into the jungle below. 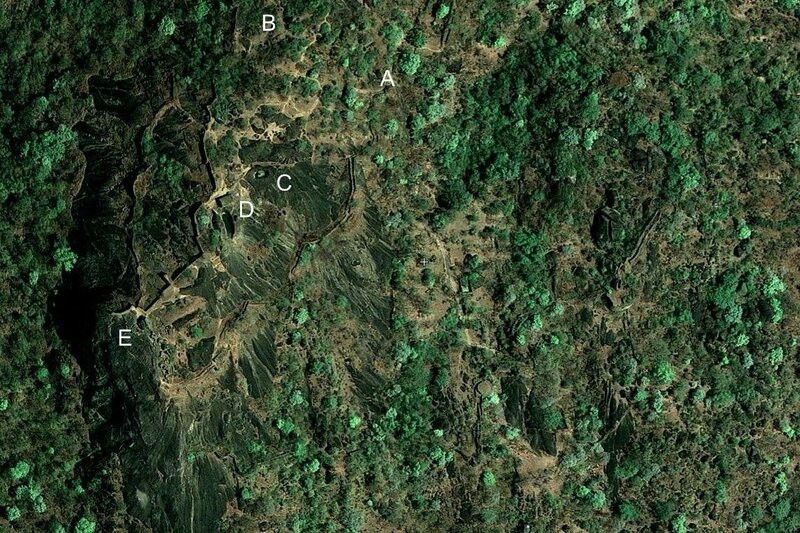 Google Maps screen grab of Chandragutti. I've not seen a wall like this one anywhere else. Built on a slope right down to the edge. 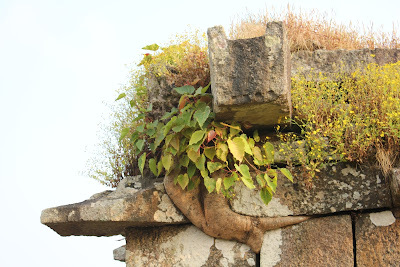 I simply cannot imagine how the masons handled heavy stones right next to the edge. Somehow I did not muster the courage to walk on this wall. One loose stone could cause an avalanche of stones and the rest is scary to imagine. Wind was pretty strong here, I enjoyed it thoroughly. I wish to come back here and spend a full moon night here. Other side of the wall. One thought; people of those days must be bold and strong enough to climb a hill like this one and that's the reason for building walls to defend this hill. A light mist hangs on these hills. After sunset mist would be thicker. 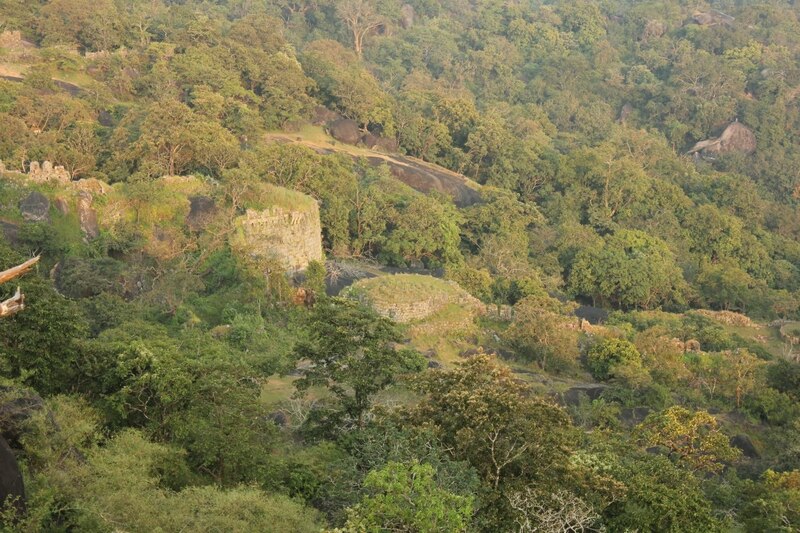 Down below in the jungle is a couple is bastions flanking a gateway I had passed through. Time to leave, I have to walk back the path through this jungle. A gateway and its approach ramp. A tank for storing water with an outlet at the far corner. Notice a stone sticking out from the wall? A large stone bowl for horses to drink water. Walk downhill was effortless. A small stretch of the path was slightly wet with rain drops. I saw the setting sun though the leaves and branches. Jumping monkeys on tree tops shook dry leaves which floated down gracefully. I considered it as blessings being showered down. The sight of this tree told me that Melina Kote Kere, the lake close to the first gateway was close by. Back at the temple, I washed my feet and face with water I carried up and down the hill. I got Devi's darshan while the end of the day pooja was in progress. Other staff were preparing to close the temple for the day. It was around 6:45 and almost dark. I did not take the steps, instead walked down another path not as steep as the flight of steps I climbed up earlier. I met Yellappa and told him I made it! I was hungry, let's get something to eat. 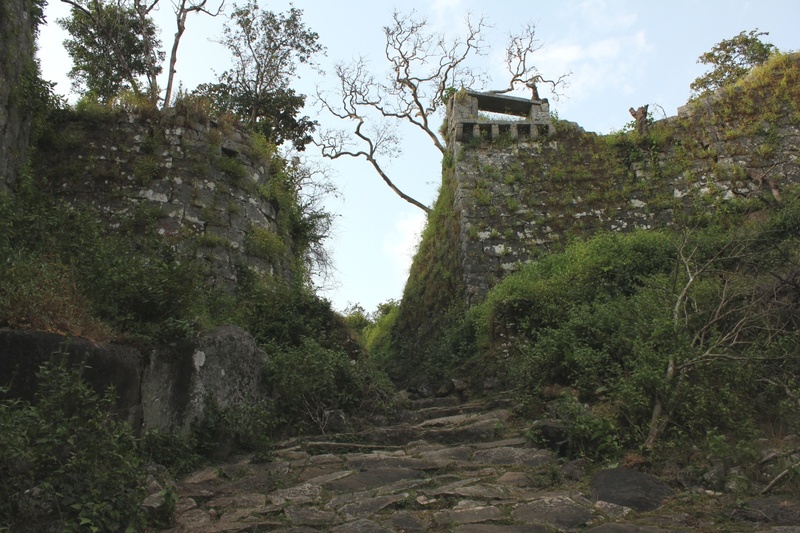 At a bajji/chaha shop, an elderly person did not believe me I had reached the fort. I suddenly had thoughts- did I missed out something? I asked him to see pictures in my camera and tell if I'd seen the fort for real. I showed him (plus few other people) Maddina Patana, Yenne Bavi and the pond with a dead cow. He nodded his yes and said you really did see the fort! What a place! What a day! I called my agriculture professor cousin Roopa Patil at Sirsi. Told her I should be at her place by 8PM. We took Chandragutti - Harishi - Sirsi road. At Roopa's place I had a nice cool bath, a change of clothes and tasty food prepared by her cook. We bid Roopa bye by 9:15, took Tadas route and reached Dharwad by 11:30. I was tired but not sleepy. Few videos shot at Chandragutti Fort. Great post!! 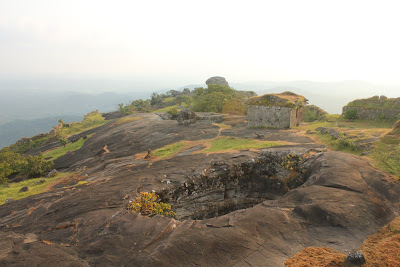 I went to the Renukamba temple in Chandragutti but missed out on the Fort.. Now I realise that its a costly miss!! I was there over three years ago. 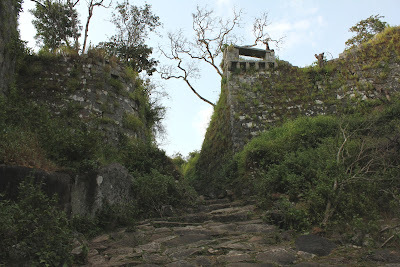 Was to see the fort, but climbed only till the Shiva temple and the Devi temple in the cave. Both of these are wonderful, especially the devi temple. 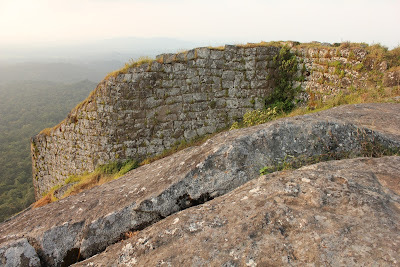 I saw only from far, the fort walls and cells on top. Your pictures are great, for now I see those in closeness. They convey the wildness, sense of "place" and so many details of the place. someday I will plan hours for the place. 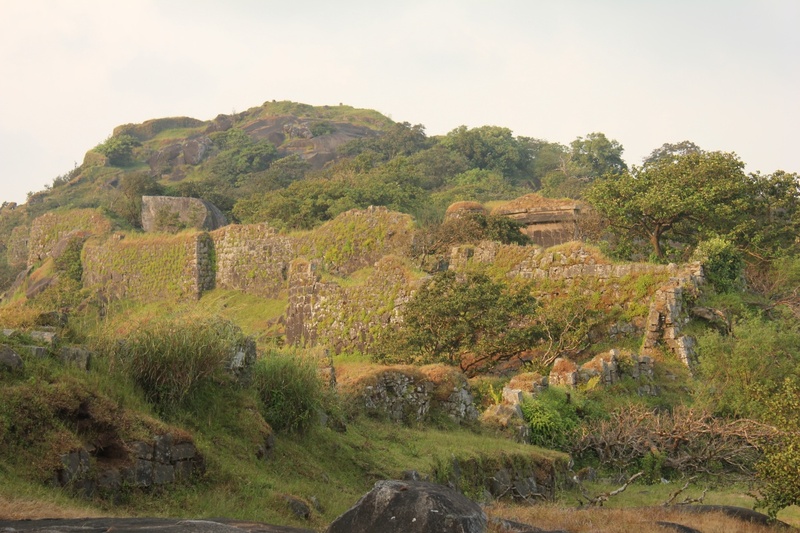 Great shots of the fort. Never knew the fort is so beautiful. skipped it when I visited Chandragutti. Thanks for sharing the photos and also thanks for the description. Thank you. 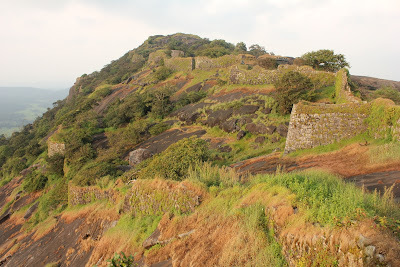 Do visit the fort some time. 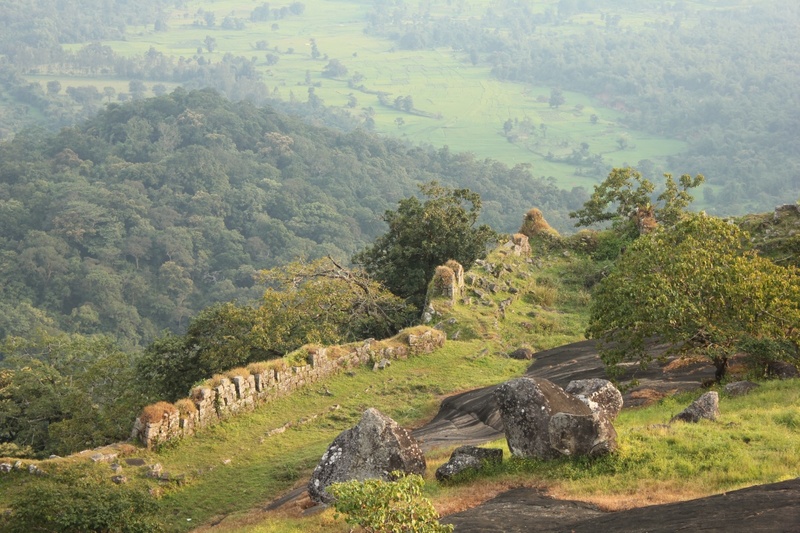 You get to spend time with Mother Nature and get a glimpse of Karnataka's past. I wish to go there again, August if possible. If rains are good then the place would be a paradise ...fresh water ponds, streams and falls would be aplenty. 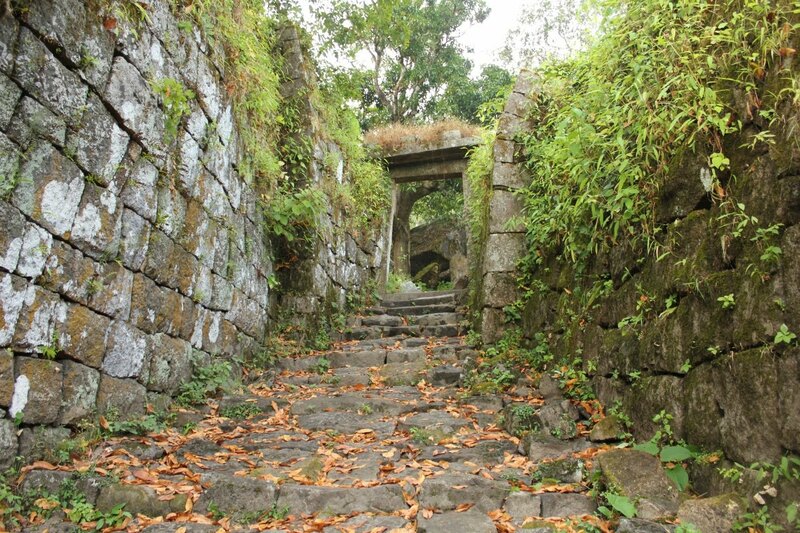 @Manjula the path is manageable for ladies. I wish you too get an opportunity to visit Chandragutti Kote. Thanks for sharing this wonderful post. Feel like going there right away! What would be the nearest place to stay? Is it possible to pitch a tent on top? @ Jahnavi I remember seeing few rooms managed by Renuka temple near the base of the hill. 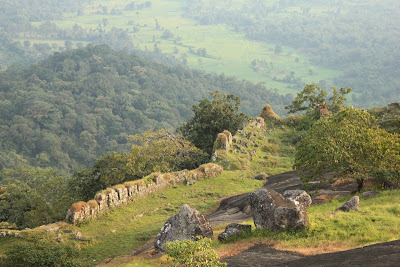 If you are looking for hotel accommodation, Sirsi would be the nearest one. I guess tents can be pitched at the top. Nicely written. I felt like i was there, as i was reading this port. Thanks. I had been to the temple, but skipped the fort, due to paucity of time. Will surely go there next time. Thank you, Yogesh. 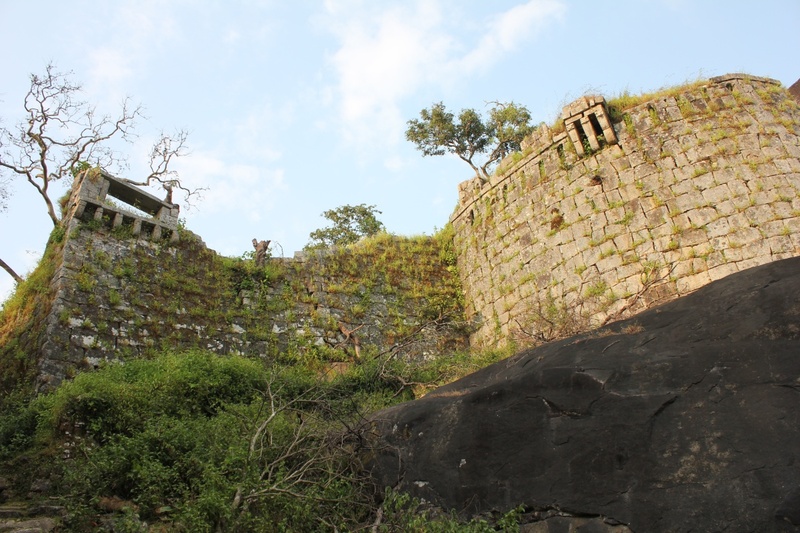 Chandragutti fort is a package.. history, nature and adventure. Do visit it. In my opinion, September - November is an ideal time, the hill would be green and lively.